Keep materials for making accessible. Oh yes! Back to how this post began: BOOKS! 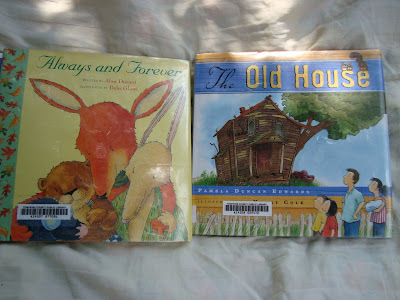 I have four picture books to recommend that we just checked out of the library. And yes, they were read in the hammock. It's Summer! by Linda Glaser is a returning favorite. The text is like a long poem or even love song about every quintessential summer moment we relish. Susan Swan's illustrations are vibrant cut paper collages that use a layering effect to create three dimensional images that leap right off the page. The back of the book is chock filled with nature activities to do in the summer. 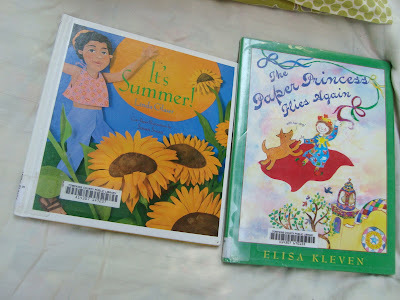 The Paper Princess Flies Again by Elisa Kleven is the third in a series of adventures about a brave and spunky princess created from a piece of paper and paint. I love all of Elisa Kleven's illustrations ( she's prolific), and this book is especially colorful as it takes place in a Mexican village getting ready for a big fiesta. I so appreciate a good princess book that depicts the heroine as strong and smart. A bonus is that this book will be appreciated by both genders, easily. The next two books are my new favorites. Always and Forever by Alan Durant and illustrated by the wonderful Debi Gliori is one of the best books I've ever read about losing a loved one. It sensitively talks about the grief process and ends with an uplifting and realistic look at how memories have a life of their own... to hold and carry on. I often hid the sadness of death from my son when he was little. I believe this was a disservice to him and left him unprepared for what we have no control over. We've changed our course with our second, and expose her to discussions, books, and nature that all deal with death frankly. This book is perfect conversation opener. And finally... are you still with me? If you love old houses... if you believe in family... if you want that eye-watering feeling... if you even just love a good ol' before/after... run out and get this book! Simple, sweet, suspenseful (kind of)... a true feel-good read! I hope you enjoyed this edition of summer(hammock) reading. Maybe I can convince my ten year old to make up a list of his great reads this past month. Happy reading! Happy slowing down! I am reading the time travelers wife and my daughters are reading Pride and Prejudice (with Zombies), The book of lost things and the youngest is rereading the last Harry Potter book and an autobiography of Coco Chanel. I have no idea what my son is reading but I am sure it is deep and meaningful and my husband reading for work mostly. Your Blog brought back those childhood memories. Even i love hammocks and use to spend a lot of time reading. 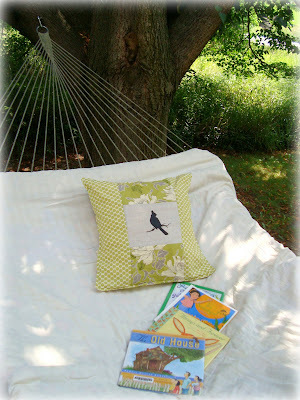 I also adore your cushion in your hammock in the top picture! wow! My son is now grown, but I kept to the philosophy of less scheduling, more free time, like my childhood times. Kids get so much more creative when left to their own devices, and you are exactly right, reading, reading, reading and more reading. He turned out great and is super creative all on his own. Check out books by Peter Sis, the illustrations are fantastic and the stories grand. Your grandmother was a wise woman indeed. I wholeheartedly agree with everything she believed. I'm glad you're continuing the tradition. As a librarian - thumbs up on all the reading. I also agree about just letting a day happen and not running around and overscheduling things. I've noticed that my toddler just plays independently and often shows us her interests when she's given the space to do it. I also much fond of reading books in the summer hot and chilly afternoon under the thick shadow of the neem tree.It is my hobby and i feel much relaxation and calmness in this.